Those who like their popcorn salty, and those who like them sweet. Then there are those who prefer microwaved popcorn and then some like popping their own corn in a pot over the stove. And not forgetting those who simply buy them at the cinema snack counter. Sooo.. all you need is caster sugar, ground cinnamon and cocoa powder! Mix together 3 tbsp caster sugar, 1 tsp cinnamon, 2 tsp cocoa powder. That’s your flavour. How do you end up with cocoa cinn popcorn then? Simple. Get a pot, measure about 3 tsp of oil (olive, canola, sunflower works fine), place one or two kernels of corn and turn the heat to low. You don’t want to get the oil too hot too quickly. So you wait by the stove (don’t worry it won’t take long. haha get a stool if you’re tired) and wait till you hear the kernels pop! This is a signal that the oil is ready. Now, throw in 75g of corn (those hard dried kernels… NTUC sells them cheap! $1 for about 400g only!) and let the poppin’ begin! Wait till the popping stops. Now, throw in your cocoa cinn flavour mixture, and start mixing in. 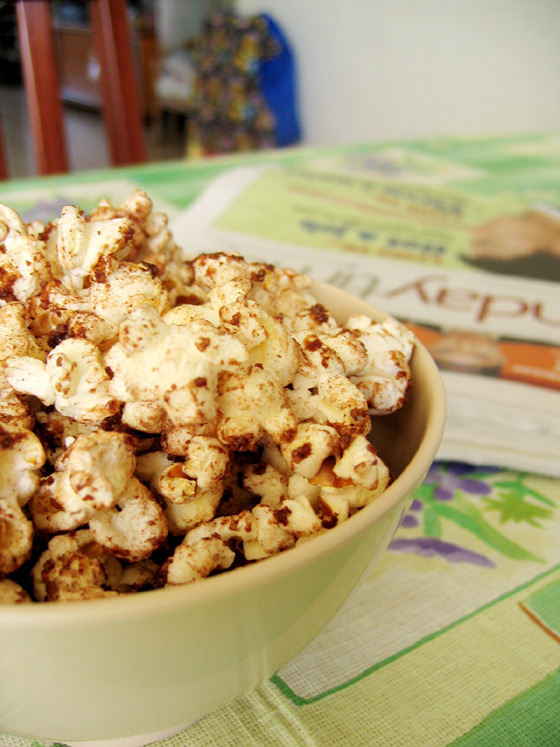 Be quick because the sugar will caramelise really quick and you want your popped corn to be evenly coated with the cocoa cinn flavour. Once you’ve mixed it in, set aside to cool and store in an air-tight container. I’ve made this cocoa cinn popcorn twice already and was happy with the results. Just ask my sis and bro. They cleared it up so quick that I found an empty bottle on my desk when I came home :p Well that just gives me reason to make more. Popcorn is really fun! I’m thinking of parmesan cheese with sea salt! Hmmm.. how about lemon pepper or even paprika! Yes, I do love salty popcorn too. Actually I kinda prefer it salty. But as usual, I’m not innately fussy so if you give me whichever, I’ll still taste it. Gosh, I’m really crazy about Cedele Depot’s cakes right now. Been eating alot of it lately! But I haven’t been patient enough to snap photos before shoving my fork into it. You know what, in my next post, I’ll describe the cakes without pictures – that will seriously put my writing to a test! Hope you people don’t doze off. haha…. Hi, talking about Cedele Depot’s cakes. I going absolutely bananas over their Banana Choco Espresso cake! It’s really sinful, but heck, I just can’t stop myself from committing the same sin over & over! hotmama: YES! tell me about it! I was raving about that exact cake a few days ago when I first tried it! I’m also crazy about their chocolate truffle cake, chocolate pistachio cake and their newest one > chocolate hazelnut blueberry roll. Uber yum! i LOVE their cakes + breads!!! Mmmmm..
where can i get this Cedele Depot’s cakes? have to try it, the way you guys describe it. I’m ashamed to admit i always burn the bottom bits of popcorn over the stove. I probably have to learn to be more patience and turn the heat down.